Interbrand has released its latest report on the world’s most valuable brands, and for the first time in thirteen years, Coca-Cola has been unseated from the throne. Instead, Apple moved up a spot to take the lead with a brand value of $98.32 billion, up 28% from 2012. There were five other tech companies in the top ten, which Interbrand says underscores the rising importance technology plays in business as well as consumers' lives. Coming in second was Google with a brand value of $93.3 billion, well ahead of Coca Cola’s $79.2 billion value, now on the third spot. The soft drink maker’s value actually rose 2%, but it’s rising on a slower curve. IBM was nudged down to No. 4 with $78.8 billion, followed by Microsoft at $59.5 billion, while Samsung and Intel traded positions compared to last year to occupy the eighth and ninth slots respectively. Interbrand bases its brand value assessment on a firm's financial performance, the role it plays in influencing consumer choice and the strength it has to command a premium price, or secure earnings for the company. It’s been an extraordinary ride to the top for the Cupertino firm, which ranked 36 and was worth $6.6 billion when the study first launched in 2000. Looking at the last year in particular, Interbrand praises CEO Tim Cook’s ability to assemble a solid team that is aligned around the Apple vision, the consolidation of both hardware and software design under Jonathan Ive, the market challenging performance of its various product lines, and its response to criticism over both innovation and worker conditions with the breakthrough, US-assembled Mac Pro. Google also received kind words as a true leader of the technology age for treading onto areas like self driving cars and augmented reality glasses -- even if they’re still to prove themselves on the market. Likewise, Samsung is acknowledged as a category leader in mobile, and important player in many other markets. Among other technology brands that performed well in this year’s report was Facebook, which moved from 69 to 52 and was the biggest gainer in value, up 43% to $7.73 billion. Conversely, Nokia was the biggest faller among the top 100, down 65% to $7.44 billion and now sitting in 57th place, while Canadian firm BlackBerry has disappeared from the list altogether after first tumbling from 56 to 93 last year. 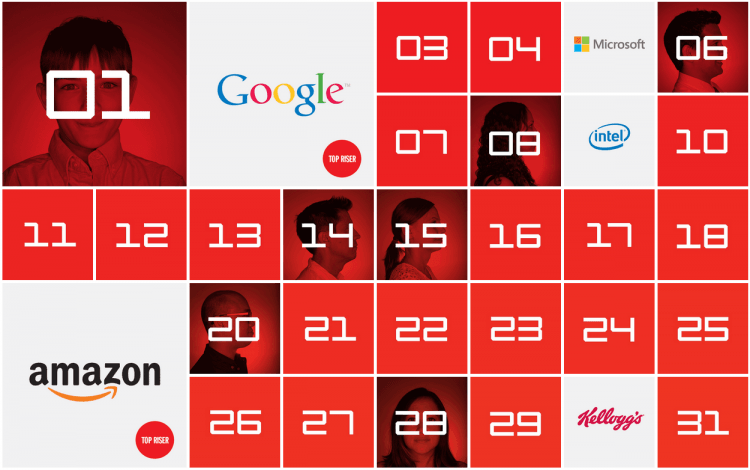 Check out the top ten below or head to Interbrand.com for the full list.